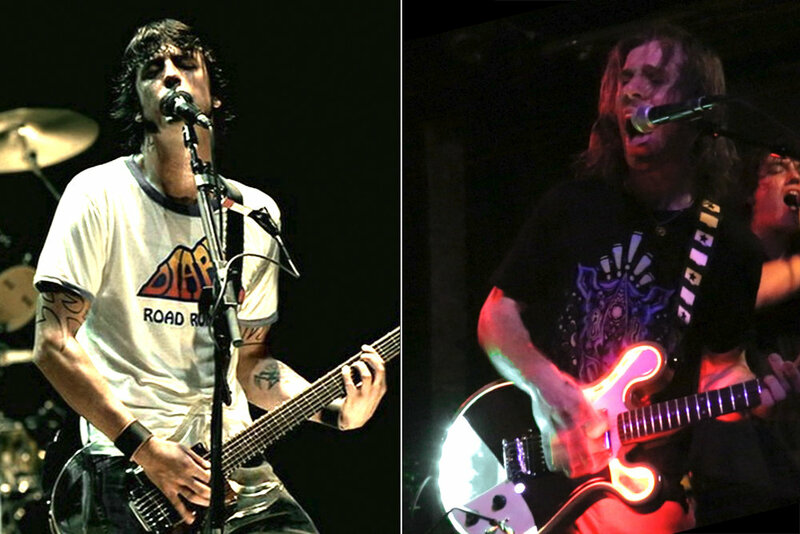 From Left to Right: Dave Grohl Playing his Dan Armstrong Acrilic guitar during the All My Life Foo FIghters VIdeo. Dave Anthony Playing his Gallo Guitar during Nemes' performance at The Great Scott In Boston. I still remember that day when I first saw Dave Grohl’s guitar on the Foo Fighter’s’ All My Life video about 15 years ago. His Dan Armstrong acrylic guitar was so awesome and captivating, that after all that time of having seen their video on MTV for the first time, it flashed back into my head as I dreamt about making my first builds. If we go back to when I was a kid, music was seen and distributed in a very different way. We didn’t have access to the internet until I was a teenager, so my only access to music were MTV, VH1 and the bands that my friends would tell me about. This obviously included all the Top 10 shows on tv and that’s how I became a huge fan of, as you may already know, bands like Coldplay, Blink 182, Green Day and Foo Fighters. If we fast forward to 2014, which was the very first year I started making guitars, there were a lot of things going on. While I was building a 3D printed guitar for a class project, I was still frustrated about the technology not being there yet, but had the will to create something completely new. That’s why, as soon as I finished classes I scraped the concept I had been working on for 6 months and started over again to create something that I really loved. During that summer, the goal was one: To make a guitar that took the best from all worlds and that I could easily reproduce. I wanted to keep the LEDs on the guitar, but I wanted to simplify the wiring and construction methods because they were very time consuming. After wrestling a lot with different Ideas, I was finally able to come up with something that I loved. I still don’t remember how I thought about Dave Grohl’s guitar back then, but I do remember that I was listening to a lot of Foo FIghters songs at the time. Nevertheless, the truly important part is that the idea came to me, and that I decided to embrace it and evolve it to create something new. I played around with materials and different compositions, util it evolved to that guitar that I was dreaming about that one day. Now, after almost four years of having started Gallo Guitars, I keep looking back and wondering what it is about Dave Grohl’s guitar that was so captivating in the first place. In my opinion It’s gotta do a lot with the lighting on that video, but most importantly it's about the edge that Dave Grohl had to use a plexiglas guitar which, just like Rock n’ Roll, was completely going against the norm. Here’s a cool update you guys. In the beginning of the summer, we announced the start of our amazing partnership with Bibi McGill, the former lead guitarist of Beyonce’s Sugamamas. Now, as you’ve probably seen on our Instagram page, we’ve been incredibly busy this second half of the year, but we couldn’t let news like this skip by. When we first started working with Bibi, we couldn’t wait to get some cool pictures to share with our fans. However, realizing that Bibi was traveling all over the world DJ-ing and giving yoga lessons, we weren’t sure when she was gonna hit the stage with one of our guitars. It was not until a couple of months ago that the very first opportunity to have some footage of her on stage presented itself. Bibi was participating on this giant health and wellness festival, that many of you may probably know by the name of Wanderlust, and she was going to be sharing the stage with MIA’s former drummer, Madam Gandhi. We were very excited on our side to see that happening, but we turned out to be empty-handed of pictures by the end of the event. It was a bummer, but little did we know, something good was starting to line up. After their performance in Wanderlust, Bibi and Madame Gandhi, carried on with their respective tours. A couple of months went by and surprise! Bibi was back from teaching yoga in Hong Kong and was now ready to share the stage with Madame Gandhi once again. This time the whole mood of the gig was different, as it was in Bibi’s beloved Portland and it was in an actual venue instead of a festival. From what we heard, it was an amazing night at the Wonder Ballroom, where they played supporting Ani Di Franco’s tour. However, there were still no pictures, but no worries, things were going to materialize for us a week later in LA. The next stop on the tour was the Palace Theatre in Downtown LA, where Madam Gandhi had Bibi as a guest in her all-female band once again. Once there, some phone pics and teasers started coming our way, but it was not until a few days ago that we finally got the pictures in our hands! Well, you guys, we are very glad to finally present you with some pics of Bibi rocking our beautiful Aurora on stage. This is only the beginning and as Bibi would say, we hope these pics will show you how to “vibrate higher!”. It’s been just three weeks since my brother and I got my “Guitar Full of Dreams” to Coldplay. In this short period of time, life has just been crazy busy, but also crazy awesome! I’ve also been traveling a lot since then, getting to visit Montreal and New York City, and now, even though things keep rolling, it’s time for me to tell you guys the story. It all started with a set of fortunate events about a year ago, when one of my friends texted me and actually encouraged me to make a guitar for Coldplay. He said he didn’t know how, but that there must be a way. Even though, I really like and admire Coldplay, it just seemed too difficult of a task to handle at the time. However, I decided to keep his words in mind and carried on making guitars. As time went on, I started streaming several of their live concerts on YouTube and they soon became the soundtrack to several of my guitar-making sessions in the studio. Next thing I know, I’m making a new batch of guitars and decide to save one for Jonny. The building process started over 5 months ago. I looked for some inspiration and many other queues that would help me catch the Spirit of what Coldplay is all about. I carried on and built this guitar little by little as my personal art project, while I kept running the studio and building other guitars. As the summer went by, things just kept getting better and busier, but I was able to have the guitar put together by mid July. This gave me just enough time to make sure everything was working fine and also about a week to take some pictures and record a demo video. Then, the time was here. Coldplay started their AHFOD North America Tour in New York City on August 1st and Boston was their next stop. I knew I had to get the guitar to them somehow, so I weighed my options and, on the day after their New York show, I started an intense social media campaign through the @GalloGuitars Instagram page. As most of you saw, I began by making a request for Coldplay to play “It Hurts Like Heaven” on my guitar for the Boston show. This post soon gained some traction and many people started liking and commenting on it. At the same time, I contacted numerous Coldplay fan pages and asked them for ideas or any kind of positive input they could have on my efforts. For the next few days, I solely dedicated myself to getting some leverage on my social media campaign. I kept making posts about the guitar and also uploaded a couple of demo videos. The most incredible thing was happening. In one end, I was mesmerized by the amount of support I had gotten from my friends, followers and Coldplayers all around the world, but, in the other, the task seemed nearly impossible. I have to admit, because this is a very important part of the story, that there were many moments during this process where I felt disheartened and doubted that this would ever happen. However, more than my will telling me to keep going, I had a feeling deep inside that was telling me that it would happen and that I just had to keep pushing, no matter where, but just keep pushing. That, alongside the numerous encouraging conversations I had with several Coldplayers, kept lifting me up when I thought I couldn’t do more and made it all happen. The night before the concert, I found myself in my apartment running out of options. I had sent a couple of emails along the way to some people related to Coldplay and also had made a couple of posts on Facebook and Twitter, but I was getting little to no answers. I persevered, did more research and sent more emails. By the end of the night I still had no answer, so I decided to give it one last shot and, against all odds, go to the stadium early next morning and see if I could make something happen. Before I went to bed, I called my brother and he said he’d come with me and help me make it happen. I woke up early in the morning the next day. I had very little sleep, but I was kind of used to it already because this is pretty much what artists do. When I got out of bed, I looked through my emails one last time before I started my day. There I found ONE answer from all the emails I had sent. It was from someone on the Coldplay team who was in the UK. She told me that she would forward the info, but it didn’t look to promising. I kept getting ready and made a sign looking for Matt McGinn, Jonny’s roadie, to see if he would take the guitar to sound test. Then, I tuned the guitar, put it in a case and went to pick up my brother. We drove to the stadium for about an hour. When we arrived, I took the guitar out of its case, grabbed the sign and walked to the complex. As we walked, we kept our eyes open for Coldplay roadies because we figured they were our best chance of getting the guitar to the crew and finally in the hands of Jonny Buckland. A short time after looking around, we had little to none luck, so we started asking around. We went to several security checkpoints and all the guards were very nice to point us in the right direction. Then, we finally got to a place where we could actually get some roadies to come see us, but we were very quickly turned down as we couldn’t call anybody in the crew. However, before we turned around, I decided to send another email to the ONE person who had answered and tell her that we were at the stadium. We made all our way back around the stadium and went to get some food. As we walked back, we hadn’t given up and kept thinking about to do next. Then, we got in line to get something to drink, so I decided to go on my phone and check my email and THERE IT WAS. The lady from Coldplay in the UK had answered and told us that she had arranged a pickup, so to please go meet someone from the crew in the ground level. We left the line and raced down to the stadium once again! When we got there, we waited around for quite a bit, but finally met two other ladies who came to get the guitar. We talked to them for a little bit, gave them the guitar for a security scan and then they took the guitar with them, letting us know that the guitar would be given to Jonny. That was the last time we saw the guitar that day. We went to have some food because we were starving and went home right after. It took us a while to process what had just happened, but it was REAL. The way I met Bibi was another crazy, but true story. Believe it or not, everything started over three years ago, the very first day that I showcased my guitars to the public at SCAD’s Out to Launch (O2L) 2014. Back when I was in school and participated in this event, I was able to meet one of Nike’s former creative leaders, or as he likes to call himself “Kayatlyst”, Kevin Carrol. We exchanged contact info and three years later this connection led me all the way to Portland and meeting Bibi McGill at her studio. To give you a little more info about Bibi, she started touring as a guitarist for Pink, La Ley and Paulina Rubio between 2001 to 2005, which later led to an audition that got her a spot in Beyonce’s all-ladies band: The Sugamamas. As Beyonce’s lead guitarist and musical director for over eight years, she was able to tour the world and play in the biggest stages, including Glastonbury Festival and even the Half Time Show of the Super Bowl on 2013. Currently, Bibi and Beyonce are in an indefinite hiatus, as Bibi is pursuing new musical horizons as an independent musician and DJ, as well as touring the world as a yoga instructor. Coming back to the story of how I met Bibi, it was a crazy series of events that got me there. An email, after phone call, after phone call, after a bunch of texts, finally got the Gallo Guitars page in front of her. After she looked at it, she now tells me that she fell completely in love with the way the light changed according to sound and all the possibilities we had to collaborate on a bigger project. She also explained to me, how she incorporates “vibrational medicine”, into her yoga and music practices, and how all of that resonated with my artwork. Nevertheless, for a musician of her caliber, it was completely necessary that she had the chance to play the guitars, to test them and see if they met up with her standards. Now, this is what took me to Portland a few weeks after. This entire trip twas quite an adventure, but I will tell you more about it on a later post. When I got to Portland, I was able to have a 2-hour meeting with Bibi at her studio. It was early in the morning, but we had to make it work as she was going on an 8-week tour the week after. While at her studio, we were able to discuss music and several other ideas. She was able to play two of the guitar demos from my Artist Signature Series: “The Soul Runner” and “Aurora”. As she played the first one, I was very excited, yet nervous about what her reaction was going to be. Then, when she grabbed Aurora, this is when it all made sense to me. I could see the reaction in her face as she played, and then it was delightful to hear all the positive feedback she had for me and my Gallo Guitars. After demoing, we sat down and chatted about new ideas for collaborating together, which, btw, to this day I feel very fortunate to have had the chance to be at that very spot at that very time. It is just an unbelievable feeling that words cannot describe! As our meeting got to an end, we rounded up our ideas. The first thing I did to make our collaboration official, was to have Bibi take one of my demo guitars on tour with her, so she could try it on a bigger stage and give me some feedback of how it accommodated to her needs. Also, once I get enough feedback from her, we are looking to build her a bespoke Gallo Guitar, completely customized to her playing needs and featuring my original artwork. Finally, we’re going to continue to work on other projects together, but this is something that we will have to share with you guys later in the future. Now that I’m back in Boston and Bibi is on the road with one of our Gallo Guitars, I cannot wait to share all of the things we’ll do together. Today, I am very pleased to introduce Bibi McGill to our Light Up The World Project and cannot wait to see her on stage vibrating higher! To read more about Bibi got to our -Light Up the World- page on this link. Bibi McGill at her Portland studio with "Aurora", a Gallo Artist Signature Guitar. Bibi Mc Gill's guitar solo during Beyonce's I Am World Tour. Travel log: Beantown to ATL and back again. Last week was a bit crazy. It was pretty amazing though. It started with a booth in Cambridge for an art market, carried on with an overnight flight to Atlanta and followed up with three days of intensive meetings. Now that I’m back in Boston, I thought I’d share some of the story with you. The market on Sunday was pretty amazing. It was organized by a cooperative from the greater Boston area called The Boston Hassle. I’d been following them for a while and thought it’d be a good idea to go expo the Artist Signature Guitars along with some tees and my personal artwork. The expo went great, got to meet lots of cool people and even got to sell some stuff, so all positives for that! After the market, we packed up, had some food and I actually went to back to packing, since I had a trip to Atlanta in a few hours. I got there really early the next day, ate something real quick and headed to a morning full of meetings at SCAD. I’d love to tell you more about it, but for now, I’ll just tell you that many great things will be coming from us in the near future! Monday’s meetings got followed up by a meeting with Lace Seymour from Gear Talk on Tuesday and a pretty cool visit to Acorn Amplifiers right after. This was also a great time: I got to learn a lot about what it takes to run such massive accounts on Facebook and Instagram (162 K followers and counting! ), plus got to talk about some cool gear. When we headed to Acorn Amps, I took a guitar with me and got it hooked up to one of their beauties. I let Lance play away and got some very positive feedback for me, which is very valuable coming from someone like him. Wednesday was the last day of my trip. I got to visit SCAD in the morning and played around with some video editing in the library computers for a while. After lunch, I got my stuff together and went to meet my good friend Art Malloy. We had a brief, but heart-warming meeting, where we discussed new possibilities, came up with some pretty cool ideas and I was finally able to deliver to him his one-of-a-kind Gallo Red Runner, which we had discussed upon graduation and now has become a reality. As time came to get back to Boston, I could only draw positives from all of the amazing people that I met with. It was an amazing time, with some amazing people who were all eager to come on board and light up the world with me! Say hello to our Red Runner. This feature build just came out of our shop and we could not keep from writing about it. In this short note we´ll be covering a little bit of everything: From the guitar´s inspiration, to its tone and custom details. This guitar goes way back. The idea of it was actually presented by SCAD´s Dean of Students, Art Malloy, to our own Jose Gallo a little after graduation. Through the following years, they maintained conversations about this custom build, and now, it has become a reality. Art is an Ohio State alumnus and loves anything scarlet and grey - he actually already owns a red bass and red drum kit as well- As talk came out about making this build, the color-scheme was no brainer for him. As for the design, he was fascinated by our Runner design from the 2016 Collection. When getting down to work, Jose made some design modifications to make this custom build a one-of-a-kind. Some of the key features on this guitar include the classic f-holes on the top of the guitar, as well as the continuous white-and-grey stripes that run along the entire border and a Gallo logo sequence lining the inside of the guitar. For the hardware, Jose decided to use chrome and black, to stay true to Art´s color inspiration. This custom build is setup with the same controls of our Runner 2.0 model. It includes a master volume and a master tone control, complimented by a three way switch located right below the bridge for a practical access to pickup selection. It includes 500k pots that give the guitar a brighter high-end and is equipped with GFS “Vintage 59” pickups to round it up into a beautiful, vintage, a little bit sparkly, tone. All and all, here it is: Our one of a kind Red Runner, with a beautiful scarlet pallet, a very comfortable feel and superb tone. 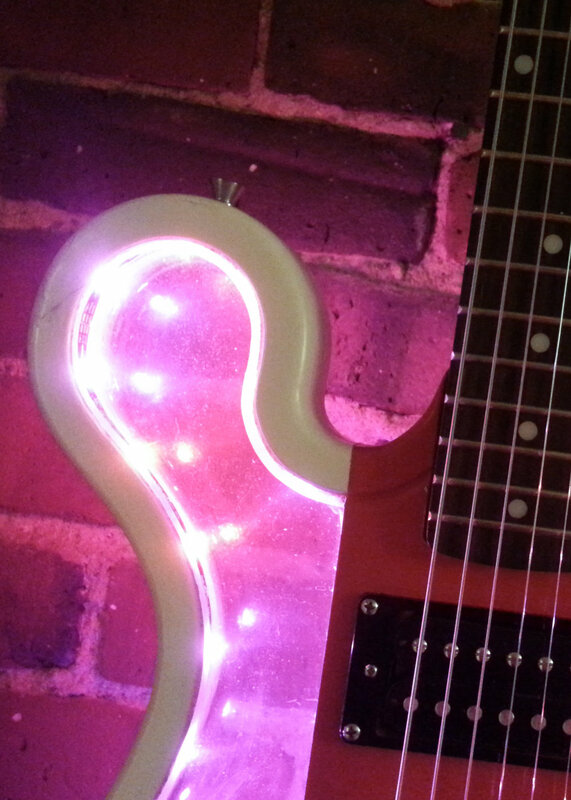 Light Up The World is our art project from Gallo Guitars to The World. Since I started building guitars, I had this feeling to create instruments that would serve as beacons of light to other artists and, through time, they have evolved to become our symbol for creativity. The concept if fairly simple, but also very deep once you take it to heart: Light Up The World by spreading creativity, love and truth to everyone and everything around you. All of us are creative in one way or another, it is like this seed we have inside us. Some people have been watering that seed and exploring its potential for a really long time, while some others don’t even know they have it. The good news is that we all do. The mission here is to help these seeds grow on everybody else. It is to light up the fire in our spirit to create and to be better. If you consider yourself creative, it is time to stop selfishly making art and start sharing it with everybody else with generosity. By art, I do not mean an object or a craft, I mean art in spirit: The act of creating something that does not exist, but that you believe in. In the other hand, if you are just realizing that you have this fire inside you, this is the time to start. If you have found yourself loving music, but wishing you could do it, then start getting closer to musicians. If you love to eat, then get closer to chefs. If you love to read, meet some writers. It is just the concept of being surrounded by art that will take you to create. Our way of igniting this fire inside you is by inspiring you. By telling you that you can accomplish anything that you dream of! For me, I just wanted to get closer to music. The first guitar I ever made, was a class project and was falling apart just as I presented it to my classmates. Even tough it was very fragile, I didn’t give up on it and, as you have seen, my guitar project has evolved from a simple idea to the reality of our own Gallo Guitars studio here in Boston. Now, note that this studio is just the beginning and it is just a place. The real artwork is not happening in a building, it is happening right now as I write this to you and as you read it. Light Up The World! You are ready for it. Nemes was the headliner at the Great Scott this past March 16th. After a series of studio visits, Jose Gallo and Dave Anthony decided to put on stage one of our Gallo Loop models. As the date got closer, both of us, Nemes and Gallo Guitars started telling our followings to come to the show on the 16th and that they were in store for something amazing. No lie, they truly were. The night of the show went smoothly, despite the cold Boston weather – only four days away from spring and still freezing here in the Northeast – . Nemes arrived early at the venue to host the event, set up and do all the band-related stuff. As for us, we got our crew in a little later somewhere around the second band. We settled in, talked to the band and took care of the logistics of the headlining act featuring our guitar. Now, we waited. We listened to one band after the other, after the other, but it was finally time for Nemes to get the stage. Dave got up and started setting up all of his equipment for the show, as he did that, Jose Gallo himself went up to the stage and passed him his Gallo guitar. It only took a few minutes until the whole band was ready and Dave walked up to the mic. He introduced the band shortly and they immediately dove into their set. Nemes opened up their set with a song of their new album and then followed with some of their more popular tunes. As they performed, Dave kept his guitar 'off' for around three songs, so nobody knew about the surprise. When they got to their fourth song and everybody was already very engaged, Dave pushed the 'power' button and played away to a very soulful guitar solo. It was a sublime act of the abstract and the rational. We could hear all the screams of the audience cheering for the light being shed by Dave’s guitar, as we could also feel David’s music vividly resonating into our bodies while making us dance even more. As the show carried on, Dave turned the guitar on and off according to what his feel desired. When they got to the last song, our Gallo Loop was shining bright on stage and resonating all over the venue. It was just a beautiful moment. Dave kept it on through all the song and then raised it in an act of gratefulness with the crowd. Their performance was just out of this world. When the show was over, we got the chance to hang out with the band and congratulated them on their performance. When listening to their own version of the show, they kept stressing that they could feel all the positivity in the air and that the atmosphere was overwhelming. It was for sure a show to remember: An act of light and spirit where artists got together and lit up the world for all of us. We were lucky enough to line up Nemes (pronounced knee-miss) for a visit to our Gallo Guitars studio. They are a Boston-based band that mainly plays around the Northeast and has toured all around the country. They’ve been on continuous growth since the release of their first full-length album “I Carry Your Heart”, released on 2014, and show no sign of stopping on 2017. Here’s a small clip of Dave Anthony, Nemes’ lead guitarist and frontmen, playing a Gallo Loop earlier last week. Hope you guys love this demo as much as we do and, if you are in town this Thursday, make sure you go check them out at The Great Scott in Allston. You may be in for a bright show and a great surprise! After two months of excitement, we finally closed pre-orders last night and now have our 2017 collection available at our e-store. With pre-orders coming to an end, we are on to publish a project that has been in the works since December of last year. This has been one of our bigger projects this far, in size and complexity, and here is a brief note on how it all came together. As we were getting ready to launch pre-orders for 2017, our lead artist, Jose Gallo, kept talking about the best way to showcase our new collection. He definitely wanted to show the capabilities of our new instruments and their musical performance, but he also wanted to do it in a creative way. When we had our guitar models ready, we invited several musician friends over to our studio to try them and tell us their thoughts. – Here is where we recorded some of our studio demos that you have probably seen in our Instagram and Facebook pages. – During these visits Jose kept thinking about making something bigger. Something specific for this new set of guitars that would show them off and really share the feeling that you get when playing a Gallo. After these visits, we started brainstorming on new possibilities and got to work. We reached out to some of our nearest friends, in and out of the city, to put together a bigger project that would involve, not one, but many artists working towards one goal: Lighting Up the World. We always talk about this because “Light Up the World” is our motto, and we wanted to create something that physically and symbolically marked the beginning of this new chapter for Gallo Guitars. Some texts and phone calls after, we were ready to record a new demo reel for our 2017 collection. We gathered at Jay Pee Chroma’s music studio here in Boston and recorded the whole thing in one long night. After getting the footage, we went on to edit the sound, put the video together and added an animated story to it. It was definitely a very fun project to be involved with and now we are excited to share it with you so you guys can keep on lighting up the world! Special thanks to Jose, Jay, Ryan, Paul, Luis, Juan and everybody else who helped putting this project together. You guys are awesome! Cheers to a new year full of light! We are already a week-and-a-half into the New Year and things could not look any better! We wrapped up last year launching our Official Collection for 2017 and opening up pre-orders for all of you guys who have been following us and are eager to put your hands on one of our works of art. Now that we are about to finish our pre-order run, we are getting ready to have our best year yet! In a short note, I want to start off the year by thanking every single person who has supported this amazing project in every kind of way. Cheers to all the talks I’ve had with other artists that had made us evolve into something amazingly better. Cheers to all the guitarists who contact us with questions about our artwork and to all the ones who physically stop by our studio to play some tunes. Cheers to all our friends and family for their unbelievable support and cheers to everyone who has put a Gallo Guitar on stage to shine some light to the world. Cheers to all the laughs and the struggle. Cheers to the long nights and the early mornings. Cheers to this incredible journey and for all the amazing things to come. Above all, cheers to believing that, with love and light, every amazing thing is possible! Light Up the World even brighter! It was another cold December night here in the Northeast. I had my film crew with me and we were headed to The Middle East in Cambridge to see Luis Gomez play with his Berklee Bob Marley Tribute Ensemble. I met Luis briefly at a gig earlier this year. Since we had just released our new models, I invited him over to the studio to try them out and take a look at our shop. The visit went great, more so that I let him borrow one of our new guitars to play on stage for this gig. As we walked in, we settled on a corner and started setting up the video equipment. Luis was busy playing the first set of the night, but after all was arranged and the band took a break, he came up and said hi to the crew. It was a very brief 20-minute break and they were back on stage for the second set. Here is where the fun part began. Luis got his Gallo Runner and got up on stage. Nobody knew it, but they were in store for a big surprise. For the first songs, Luis played it with the lights off since he was mainly playing rhythm guitar. The band had made remarks earlier in the day about how much they liked the new guitar, but they didn’t know all it could do. Then it was time for fun. A new song started and Luis had a cool guitar solo for this one. Him and the band breezed from melody to melody and then it was time for Luis’ solo. All the instruments started modulating and the spotlight was on Luis and his guitar. Even the singers stepped aside to let him play. As the band turned their attention towards Luis, the magic started happening. Luis played lick after lick and with it came a burst of colorful lights that nobody knew about. This moment was very exciting for me to see, since I could see the band trying to turn around and peek at was happening behind them, as well as seeing the audience go crazy about his guitar as well. The gig only kept getting better. The band played classic after classic, getting people off their feet and dancing all over the place until the last song was over. As for us, we kept scrolling around with our cameras to capture the spirit of such a beautiful moment. This year is closing on the best note we could have ever imagined! We have done SO MUCH this year and we can clearly see the spirit of our growth in our new collection. Our lead artist Jose Gallo has created a wonderful triplet that will visually and musically blow your mind away. Bellow, you will find a brief description of every model. The Runner 2.0 was the first release for our 2017 collection. For this model we wanted to go simple and minimal, so we took what we loved from our 2016 Runner model and applied it to our new model in a very minimal way. One of the biggest highlights of our new Runner is that the middle stipe is not contained inside the wooden frame, but instead wraps around the entire guitar. Additionally, we decided to eliminate the white background on the sides of the middle stripe and made it crystal clear. We don’t know about you guys, but we think this was a beautiful decision from Jose! Finally, we wanted to remind everybody that the beautiful things are on the inside, and what a better way than a Gallo logo array all over the inside lining of the guitar. Loop was released a week after the debut of our Runner 2.0. What is very characteristic of this model is that there is not a single straight line in the design. Contained in the contrast with it’s frame, the design on this one suggests a looping movement that merges into the infinite possibility of where the lines continue behind the frame. Letting us with the task of closing that ‘loop’ with our imagination. One of the key features on this design is a more elaborate color pallet, which includes 4 different tones and colors, which allows a play of dimension between planes created by physical and tonally implied overlap. Additionally, our Loop model also features a more-subtle Gallo Logo array on the inside, which is a very nice finishing touch for such a beautiful work of art. Bloom is the last, but not the least of our collection. Starting from its dominating orange face and merging into its border, Bloom makes a wonderful play of organic and geometric forms. On top of that powerful orange, the guitar counts with a very strong play on hues and tones, making the other color interact and give it a very dimensional quality in contrast with the paint’s flat nature. Additionally, one very cool feature of this model is the position of its controls, which includes the pickup selector, the volume and tone knobs and the power button for the sound reactive light system. We made the new arrangement very comfortable. If you can’t imagine it, just trust us on this one. If you enjoy our new collection, go check out the specs every model at our e-store. We have 30 available for pre-order and will start shipping the first production run the last week of January 2017. A week ago I flew to the West Coast and took another of our Gallo Custom guitars with me. It was a long trip from Boston. It is literally traveling from one extreme of the country to the other­, but I was very glad to get to drive around San Diego and get more familiar with the area. I just spent two days over there, but was able to stop by the beach and take some pictures for you guys before I delivered it. On this custom build I had complete artistic freedom over the design of the guitar, so I gave it several personal touches. It was also for a punk-rocker, so that affinity made working on it even more exciting! For this build I used some previous ideas from our first edition like the exposed mahogany border in our Gallo One and the paint-dripping pattern on Vanilla. Concluding in one of my favorite custom builds to this day. Here are some process pictures of this custom build at the Gallo Guitars Studio and some more by the beautiful Pacific Coast. Where to next? It was an afternoon like no other. I had been going to Purse’s gigs all summer, but this one was a special one. Jay Pee Chroma and Life and the Good Times already had their custom Gallo Guitar and this was the night they were debuting with it. I met Jay Pee and Ethan around 6pm and then headed towards Cambridge. We got there, unloaded their gear and went to grab some food. After we were done eating, we entered Club Bohemia and decided to hang out to see the other bands play. Life and the Good Times was playing second to last, so we still had some time to mess around. The gig was a mix of very different acts and genres. The night opened with a band from Texas and then went on to a local Jazz band that had a surprisingly big following. Both acts were fun and entertaining, but now it was time for “the good times” just as Jay Pee likes to say. Life and the Good Times was up next. They got up and got the stage ready for the show. As they did that, I started setting up my camera and talking to the sound engineer about what the best lighting situation would be. When I was done with that, I went back to my spot and started seeing some familiar faces. The stage was fuller than I’ve ever seen it before. – I was already excited, but all that people made the whole atmosphere even better! – It was only a few minutes until they started to play and I could not wait. Then, amazing tunes happened. Jay scatted to the drumbeat, and the rest of the band started jamming. They did that for around a minute and then they jumped right into their first song. ‘Beautiful Mess’ is a funky song that talks about sexual discrimination and how “they can say whatever they want, because this kind of love is beautiful”. As the opener concluded, they went for ‘Apparently’ a faster song that talks about society standards and how people tell you that you should do this and that because apparently, that’s the way things should be done. After these two, it was time for a love song, MIA, and a tribute to an artist we all admire: Prince. Before that song, Jay Pee went to the microphone and talked about how much Prince influenced his life and how much he deserved this tribute. Juan, who had Jay Pee’s guitar for this one, started playing and everyone immediately recognized that they were playing a cover for ‘Kiss’. The crowd went absolutely crazy on this one. Everybody was singing and dancing around. I even got so excited that I almost dropped my camera and started dancing as well. No lie. The positive vibes were infectious! The good times just kept coming. They played a couple more songs on the set and closed with their rockiest song ‘Sassy Strut’. This song talks about a man who thinks he has it all, but actually has nothing. He plays with girls, he wastes money, but he has no happiness and it’s all an act for a man who lacks character. I love this song and I think it’s the perfect closer. On this one they really managed to get everybody on their feet and dance to their amazing funkiness. Not all Gallo custom-made guitars make it to the blog, but this one is so special that it’s very worth remarking on. This one, I made for Jay Pee Chroma, the lead singer of Purse. It had been very long in the planning and is now a reality. I met Purse in January after I moved to Boston. I have known Jay Pee all my life, so when I came up here, he introduced me to his band and invited me to some of their rehearsals. Back in the beginning of the year, Purse was starting to produce a new set of songs for their new EP and had in the plans to start touring once they had a solid set of funk-rock songs to get you dancing. This is a very cool story. As I settled here in Boston and got installed in the new Gallo Guitars studio, Jay Pee, Juan and Eithan were also working very hard in their musical project. It is like we have both been growing together, moving forward and not stopping at any cost. Now that Purse is finally touring, it seemed fit to finally design a guitar that would add to the funkiness of their act. During the past month, I met with Jay several times to talk about designing his new guitar. At first we talked about making a Purse-inspired guitar to evoke their funkiness, but then we decided to custom-make a guitar catered to Jay Pee’s taste. As we kept meeting, Jay kept stressing his love for funk, the white/purple combination and all the influence he’s got from Prince. He also talked about how much he liked the curviness of poster-art during the 70’s and how much he would love to have a guitar inspired by that. It all sounded great, but now the challenge was up for me to create something resembling to Jay Pee’s character. At first, I was tested by the looseness of a 70’s graphically-inspired design. As I kept sketching, I realized that Gallo Guitars are very curvy themselves and that’s when I was able to move forward. Instead of saturating the inside of the guitar with curves, I decided to accentuate its silhouette, which added to Jay Pee’s desire of a minimalist use of lights and gave me a design that I could finally work with. The guitar went through its routine creation process, which included creating a color scheme, digital sketching and physically making it. When it was all done, I added Jay Pee’s artistic last name “Chroma” to give the guitar a personal touch and put it on the drying rack. When the guitar was ready I contacted Jay Pee and personally gave it to him. I was very excited because this guitar is not only an instrument, but is also a symbol of persistence on both of our parts. I am as proud of Jay Pee and Purse, as I know he is for Gallo Guitars and for me. I cannot wait to see Purse finally playing a Gallo on stage and it will happen sooner than later. Want a clue? Go to Club Bohemia in Cambridge at 9pm and you will be in for a great surprise! We sat down with Jose Gallo at the Gallo Guitars studio in Boston, MA and asked our lead artist about his vision for Gallo Guitars, how it all started and a couple of more personal questions. Make sure to read bellow and don't miss a thing! What does Gallo Guitars stand for? Gallo definitely stands for my last name. Just as Leo Fender and Orville Gibson named their company after themselves, I decided to do the same thing. The name could be something with lights or something futuristic, but honestly Gallo is the perfect fit. In my studio I am not trying to replicate creations from any other guitar-makers, I am making creations of my own. This whole spirit of creation and belief over the unknown is what Gallo Guitars stands for. It all started before I even knew it did. I remember being a little kid and watching the “All My Life” video by the Foo Fighters on MTV and thinking how cool Dave Grohl’s clear guitar looked. Back then I had no idea that I was going to end up making guitars, but when the opportunity came, I just got inspired by that memory and used everything I had to make my own. The actual story happened after a trip I made to see my brother in Boston for the Holidays. I got to hang out with him and many other musicians, which, combined with my interest for performance art, got me feeling really great about that entire atmosphere. After I came back to school I had the perfect scenario: I had two classes, Technology in Sculpture and Advanced Computer Modeling. Then, the idea of designing a guitar and merging both classes into one big project came to me and, even though I was doubtful at the time, I never looked backand went for it. A leap of faith, that’s how it started. Why lights on a guitar? Because you can light up the world. There’s this duality between light and darkness, but I look at it as darkness being defined as “the absence of light”. To me, Gallo Guitars is a beacon of light to creativity, expression and truth. I want light to be shone over artists who, just as me, believe that they can make a difference. So, who exactly would play a Gallo? At this moment, we are focused on supporting up and coming artists. People who have an act, a really cool idea and want to visually and acoustically enhance their performance. Overall, we are looking to support performers who want a nice visual addition to their repertoire and would love to be playing a work of art. What about the sound? Does the material affect it? It obviously does. In acoustics, any material that you attach to a body would affect the resonance of such body. The real question is if the material affects it positively. The answer is: Yes it does. You see, A Gallo Guitar is made of two components: Plastic and rare wood. They both have an individual set of characteristics very proper to them and combined they create a masterpiece of its own. For plastic, you have its transparent nature, plus you also get a bright sound, just as is expected because of the density of the material. In the other hand, you have the wooden component. Lets say Mahogany for instance. This type of wood is recognized for producing a very warm and full tone, plus it is also sturdy, thus adding a tonal and structural component to a Gallo Guitar. The end result: A stunning guitar with a beautiful tone. Ok. So, I have $1,200 for a guitar. Should I buy a brand name guitar or should I bet on a custom-made Gallo? I think it is honestly up to you. It really depends on what you are looking for. If you are looking for a name, a specific look or a specific sound, you should really consider buying the instrument that is going to emulate what you are looking for. If you are looking for something different, visually stunning and something that you can make your own, then I would definitely go for a Gallo. I design my guitars for performers, for people who want to stand out and make a difference, but at the same time can be united through the commonality of the light all our guitars shed to the audience. Lastly, if this is not enough of a reason, then know that you are buying a work of art. When you do that, not only do you get artwork specifically made for you, but you also support the artist, his creations and what they represent. Now, time for a couple of personal questions. Do you play? Yes I do! I remember the feeling I had when I built my first guitar, I knew a couple of chords, but it was really frustrating to have something so cool in my hands and not be able to use it to its full potential. Since then, that feeling had me very motivated and I took some classes here and there. Now I just like to experiment and learn new things. I make a tool for artists, so I may as well use it to generate more creative output! It’s just a drive that I have. I cannot explain it, I just have an idea and I want to make it happen. And when it happens I want to make it better. – I am just a builder in everything I do. – I like to inspire people just as I have been inspired and I think all of that comes from having a grateful attitude. Gratefulness towards the people and the opportunities you have around you and knowing that those will take you far if you believe in them. Belief is the most important and if I can be a beacon of light for you to believe that you can do anything good for the world, then I will always be inspired. I will always believe in art. Finally, any new plans of some cues you can give us on what’s to come? Well there’s a million of plans in my head already, but we need to take it one step at a time. As of right now, we’ve been working with a couple of artists here in Boston to put more Gallos on stage, so you can definitely expect more of that. Additionally, and I will leave you with this, keep an eye out for our new signature series coming in October, there has been a lot of work put into them and we are very excited to share them with you to light up the world with some amazing art! Hey guys! As Jose mentioned on his previous post, here are some new videos with Daniel Patiño Quintana and his custom-made Gallo Guitar. It has been a great experience to work with Dan and we really do hope you enjoy his music and these new guitar demos he was kind enough to record for us. The demos are set up as a live studio session where Dan is playing two original songs: ‘Joaquin’ and ‘En la Boca del Monte’. For ‘Joaquin’ Dan Pat is using the Seymour Duncan SH-11 humbucker on the custom setup Jose built for him and is also playing with our LED sound reaction system. So this is a very good video to watch some lights and listen to some beautiful tones. Dan’s original ‘Joaquin’ is about a young man named Joaquin who is lost in alcohol. It talks about his struggle with this substance as his father tells him that he is becoming a beast. The song then ends with Joaquin talking to you and advising you to not follow his messy steps because if not you will become who he has become: "poor, old Joaquin". The second song is more upbeat and is very proper of Dan Pat’s repertoire. In this, like in many others, Dan is taking us back to his home country Costa Rica. For this one, he is telling us how in Costa Rica it storms so hard, that you can see rain actually rising up, instead of falling down. This, you can see in his song when he is singing “llueve al revés” which directly translates to “it's raining backwards”. For this song, he is using the P-90 on his custom setup, which gives it a slightly brighter and hotter tone, which fits the tropical nature of his song. Also, for this session Dan is playing with our sound reaction system turned OFF. This is a good way to show the range of options that he gets as a performer with his custom Gallo Guitar. Finally, we would like to extend our gratitude and best wishes to Dan. It has really been a pleasure working with him. To keep up with his music follow him on Instagram @yosoydanpat or on Facebook @ Daniel Patiño Quintana . The first question that may pop into your mind is: What is Vida? Well, long story short, Vida is my latest custom-made guitar. I didn’t know its name until the day I finished it, but when the moment came, Vida felt just right. You see, the process of making a custom-made guitar is very much different than designing an edition for Gallo Guitars. Even though they all start organically at the same place, the thought process is completely different. Instead of sitting for hours just thinking and sketching different ideas of what I want to convey in a new edition, the process is now the one of collaborating with someone else. The process always starts with an idea. Its starts with the vision a musician has for one of my guitars and how they will compliment their act. This process may be as quick as their impulse or may take months in the building. Now, once I get in contact with the musician we sit down and get to work. This case was no different when I created Vida for my friend Dan Pat. 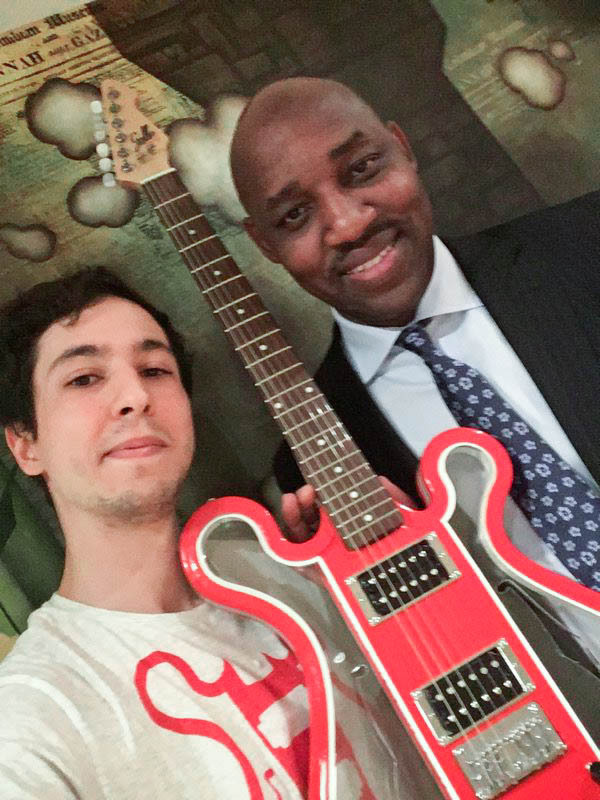 We met, I told him a little bit about my artwork and a couple of months later we were talking about custom-making a guitar for him. It is a pretty interesting story, but more on that later. When I make a guitar for an artist, I always ask them about their music. I also about what they like, what moves them and what they want to say. When I asked these questions to Dan, he told me this really cool story about his music and its relation to Costa Rica. Dan is originally from there and likes to irradiate a very positive vibe with his songs. He talked about his lifestyle of spreading happiness and how you can see Costa Rica’s modo “Pura Vida”, which means “pure life” or “pure joy” in Spanish, in the way him and most other Costa Ricans live their lives. Also, I asked he would like to see aesthetically on a guitar and he said that he very much enjoyed geometric designs. After Dan left my studio that afternoon, there were two main concepts that stuck with me. The first was the idea of spreading happiness and this tropical vibe through the concept of living joyfully: ‘Pura Vida’. The second, was the idea of how would that look on a guitar and how could I apply that to a design that would compliment him on stage. All and all this is what remained in my mind: make a guitar that speaks joyfully on a tropical, yet geometric way. Pretty overwhelming, but I was up for the challenge. It was time to get to work. I made some sketches, but, as usual, you have to go through several of them until you find the one that you like the best. Once I had picked out the best, I made a virtual sketch and worked on color schemes. When I had finally settled on a design I liked, there was nothing much to think and it was all execution. Putting this custom-made guitar together for Dan took a couple of weeks, but when it was finished I was very glad I took my time to make it look as great as I wanted it to be. Exposed wood grain: I have no idea what turns my brain on so much about seeing the wood grain on this guitar, but I am pretty sure it has something to do with the material interaction between the plastic clear tops and the wooden frame. 7 color design It is tough to learn how to make a one-color coat look great, but now multiply that times 7! It wasn’t the easiest of tasks and there was a lot of waiting and persevering involved, but I am very grateful for the final look in this guitar. Tone-wood and pickup set-up: Vida’s body is made out of Ash, which helps me give a warm-full feel to the guitar, complimenting the naturally bright tone of the plastic top and bottoms. The Seymour Duncan SH-11 also ranges towards the warmer side, while the SD P-90 gives it more of a range with a slightly brighter, yet hotter tone. All and all, a great combination. Sound Reactive Setup As all of my Gallo Guitars, Vida has also installed within a sound reactive setup, that changes color depending on the notes you play. I have also installed a lithium batter with a charger and a USB port that plugs right into the wall.